On Earth Day, April 22, 1994, half a billion people around the world joined together to put forth new environmental visions for a sustainable future. High school and middle school students and youth groups across California’s San Francisco Bay Area got a head start by participating in the creation of Earth Team, a collaborative conservation network connecting Bay Area youth, teachers and youung leaders with numerous environmental, educational, and government organizations; here was a niche that needed filling. 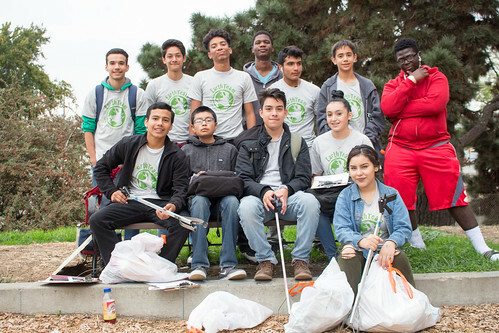 High school environmental clubs and environmental academies and pathways felt disconnected from others of similar interest and discouraged by the general student body’s response to environmental concerns. Earth Team aims to change this. Earth Team is committed to delivering quality service-learning projects by partnering with the strongest educational, environmental and government organizations. The students will think globally by using the vast amount of information offered, connect regionally by working with students from other communities, whether on joint projects, at special events, or on the website, and act locally in community based projects. Earth Team’s first year was very successful. In the first six months, twenty-four groups or classes signed up and 170 students received Presidential Environmental Youth Certificates for their environmental work. Please explore this website for a basic look at where we are today.